This was a recipe from Herbivoracious' desserts section. It was difficult to find a dessert that was both gluten free and sugar free. This was the only one. I thought it would make a great snack for the big NFC Championship game. It was a very stressful game but the Seahawks squeaked by with a win over the San Francisco 49ers which led to a Superbowl win. I paired the pears up with Seaside Cheese Co English cheddar, Uniekaas gouda arrano, Simple & Crisp dried oranges and Lesley Stowe Raincoast Crisp crackers. They all went well together with the maple and cider vinegar soaked pears. 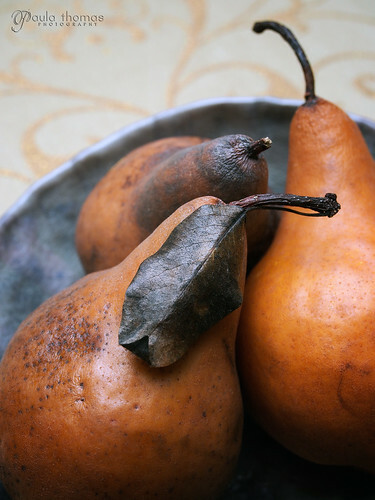 I have to admit Bosc pears aren't my favorite pear. They are a grainier pear but probably hold up better and don't get too mushy so I thought they worked pretty well for this recipe and they didn't seem as grainy.